So, as promised to LimeTree, here are some pictures of the system I am currently using to track projects. It's based on David Allen's GTD binder (not the book, I could never get through that! 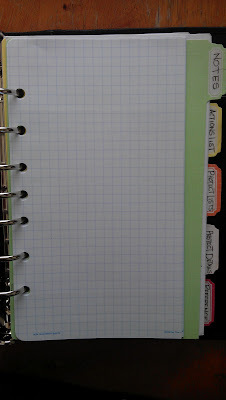 ), which I bought at Staples. 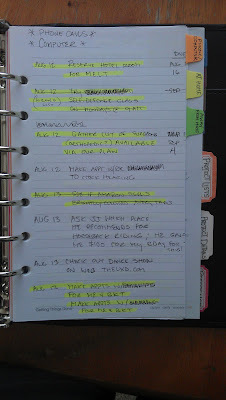 First off, just last week I separated all I'm about to show you from my planner/journal pages. I now have two separate binders and feel much better. Having everything in one binder was just too darn heavy and too squashed and too oppressive -- too many to-do's in one place! Besides, I don't need to look at the project stuff daily. I look at it weekly IF I'm really on the ball. It's a new system to me as of August, so it's still in progress. After I took the pics I realize that I can consolidate some projects. 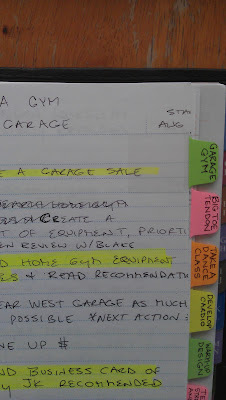 This is the first time I've actually developed a system to track projects; in the past I've typically been preoccupied with what was immediately in front of me and no further. So far I'm very happy with it as I've made progress in some of the projects AND I have a place to log details of projects that are not yet underway. Below is the first page of my NOTES section. 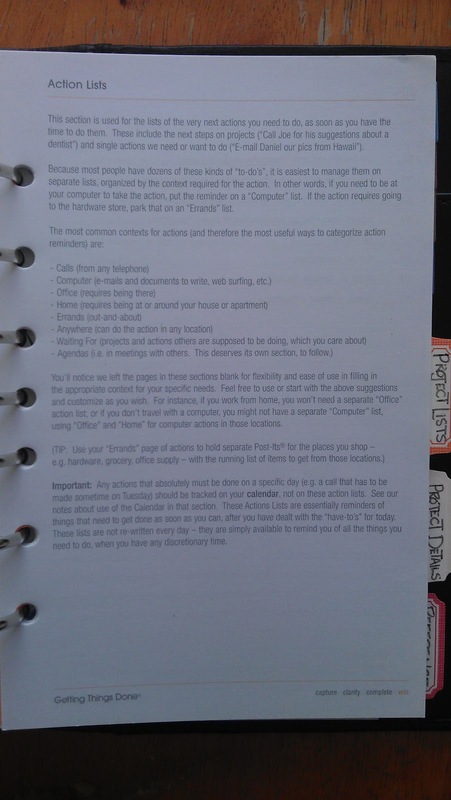 This is an actual insert from the GTD organizer. It's somewhat of a random area, a braindump section, and I don't really use it much, but I might. I'm okay with the jumbledness of it, and I've decided not to put any time-sensitive stuff in it so it's okay if I forget about it. 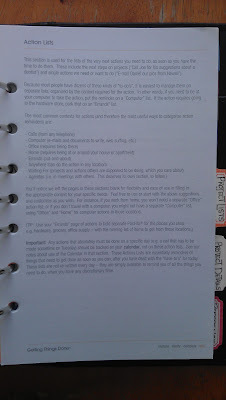 The official GTD instructions for using this section is immediately after this picture. 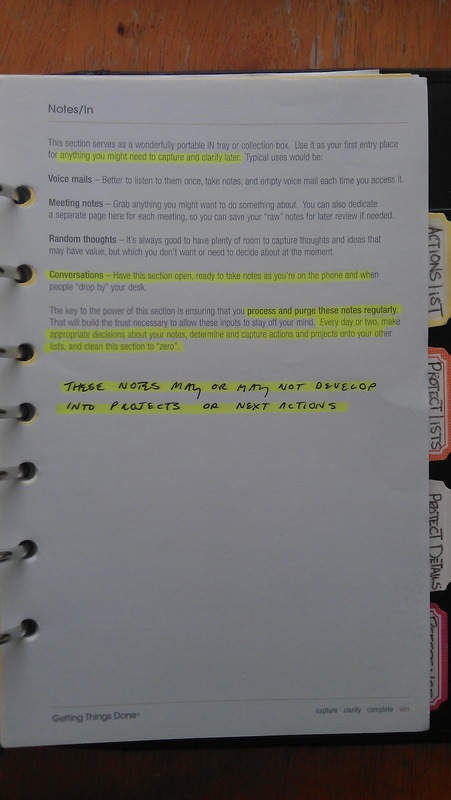 Here are the GTD instructions for NOTES. 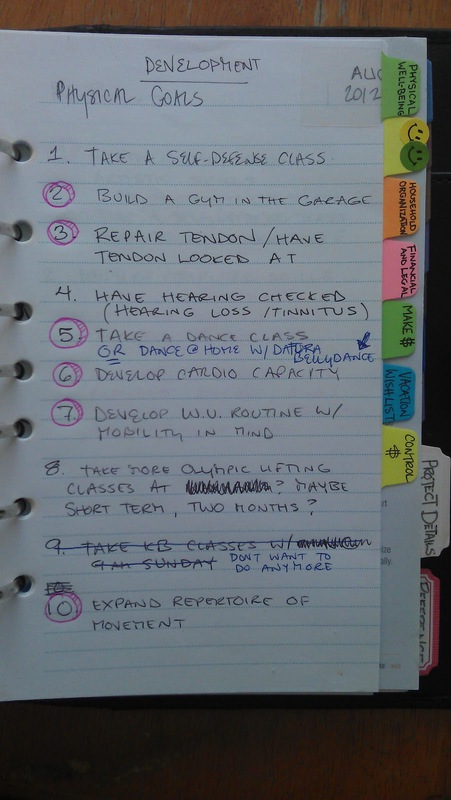 I put all the GTD instructions at the back of each section so I can refer to them as needed. I bought the GTD binder strictly for the instructions, not the inserts or the binder (a cheap-o, plain black, padded vinyl affair with no closure... but at least it has rounded corners! Oh, and only three-rings -- imagine! The nerve.). 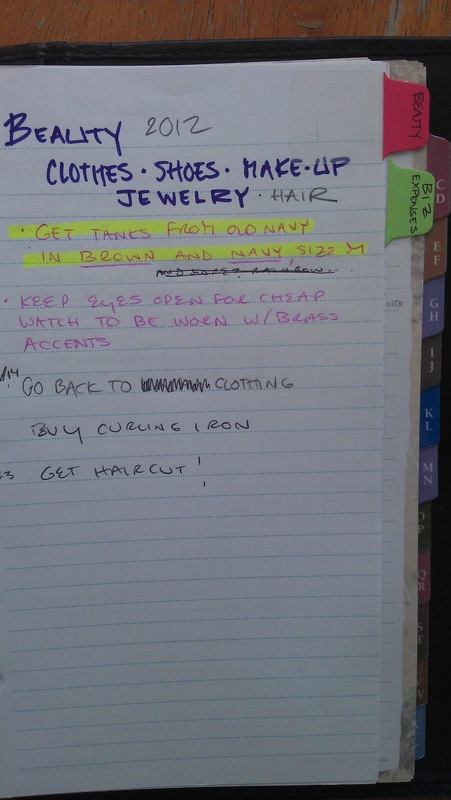 This (below) is what lies immediately behind my ACTIONS LIST. Now you can see why I trim the right margins of my paper - it allows me to sub-divide each major section. I love this solution to taming tabs! Very pleased with myself. And this is the GTD explanation of ACTION LISTS. I'm not going to post any more of these pages, I don't want to infringe on copyright or whatever. This should give you an idea of what the binder contains. It's pretty awesome. The instructions alone were worth the money because they made a positive difference for me whereas the book was too overwhelming and only served to make me feel small. A look at one of the section dividers. Each section is a different color. Behind the PROJECT LISTS tab, it looks like this (below). The smilies temporarily obscure a private category. Behind the PROJECT DETAILS it looks like this (below). I'm not showing the complete page for the sake of privacy. 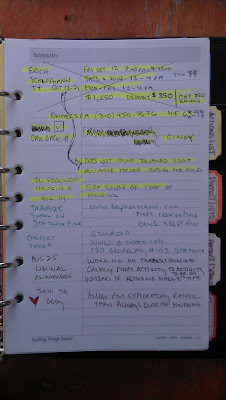 Behind the REFERENCE tab (below). 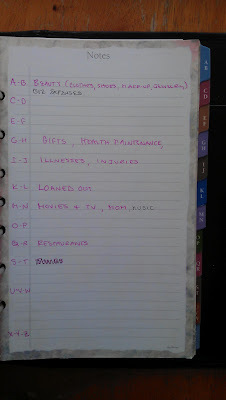 I have an informal index page that correlates with the A-Z tabs. 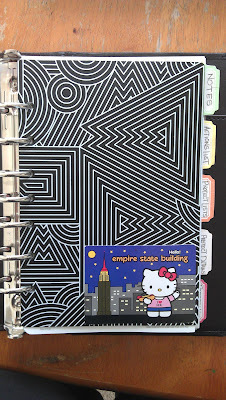 Those tabs are intended for an address book, but I've re-purposed them for, again, non-time-sensitive items. I really like it! I have a place to dump all the songs I want to load onto my iPod, etc. P.S. If you've read the photos closely, you've noticed that I'm "into" movement/exercise. Here's a clip of me at a Powerlifting Competition last July 2, 2012. I deadlifted 248 pounds! It was my fourth competition ever, and all done in the course of one year. I also bench pressed 99 pounds at the same event. Below is a pic of our group (I'm third from the right). That's pretty cool the way you did those sub-tabs. I never would have thought of that but it's so functional! You're welcome, thanks for the feedback! Lime Tree - I struggled with too many overlapping/obscured tabs, too, and that's why I'm so happy with my solution. I literally will put myself to sleep at night sometimes, by going to my happy place (trying to figure out a solution to a planner problem). Haha! You're welcome! THANKS FOR COMMENTING! I love your slimmer pages with sub-tabs! Going to do the same RIGHT NOW. Glad to hear it, Yvonne! Have fun and thank you for taking the time to reply! Your binder set-up looks fantastic - makes me want to replicate it in my Filofax! Oooh, now there's an idea re: mixing personal sized FF paper and FC compact inserts... I've never bought the FC compact inserts, but I've looked at plenty of pictures and hacks showing the difference! Happy to hear you like it. Reply back with your results when the time comes! Ditto to the subtab comments! they will beeven better in my A5s as there will be plenty more paper left to write on. Genius idea. Simple, but genius! Hello, Helen! Glad to hear that you like the sub-tabs! 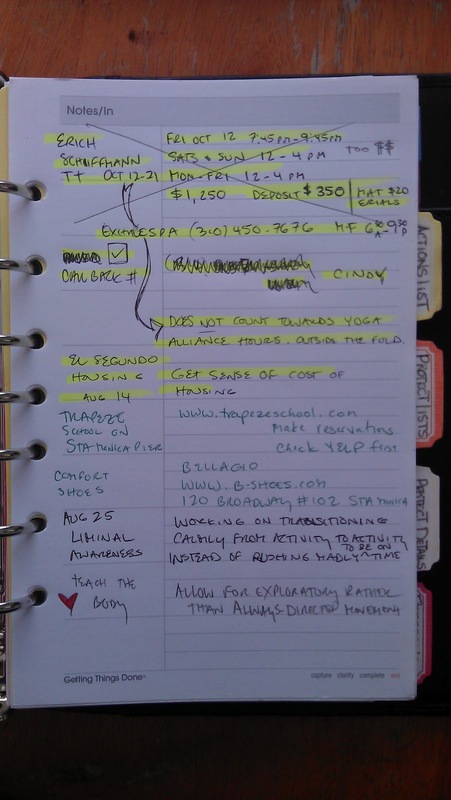 I'm using the DayTimer Desk-sized paper (same as Franklin Covey Classic) so they are really close to A5 size and I'm very happy with all that real estate after using a FF Personal size from January to August. Thanks for dropping in and letting me know what you think! 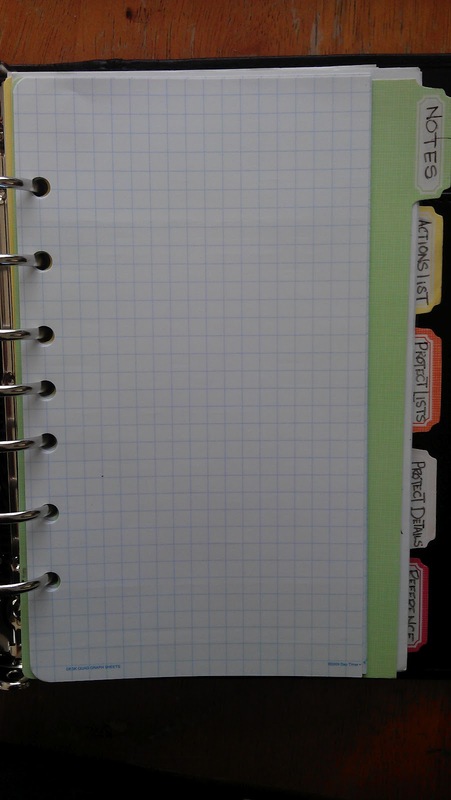 One thing I miss about Franklin Covey is that with 7 ring binders (DayTimer, DayRunner, too) is that you have so many more inserts options, especially all those neat inserts by Martha Stewart (the page protectors that are full, half, and quarter divided-love those-plus the tab dividers in plastic and cardstock). Plus the many variations of calendar and other assorted refills from companies mentioned above. I love my A5 Filofaxes but am so frustrated with the lack of inserts available locally here in the US. Of course I order stuff online but the selection is boring and its so easy to just run to Staples or Office Max and pick up what I need vs waiting for mail delivery. I don't see how I can part with my A5's but I really don't feel that I am using them to their potential. Anyway, love the sub tabs! Hey, Cheryl, happy new year!! Yes, I feel the same way about my A5 Kendal. 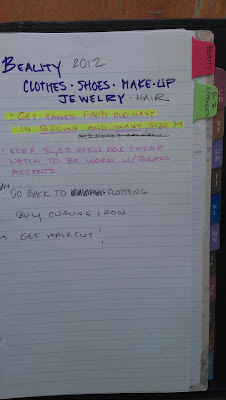 I love the look and feel and smell of it, but I just use it as a notebook more than an organizer or planner. I filled it with some pages I got from a Milquelrius notebook (http://www.shopmiquelrius.com/servlet/the-703/*NEW%21-Emil-Kozak-Geology/Detail)I purchased at the Container Store. 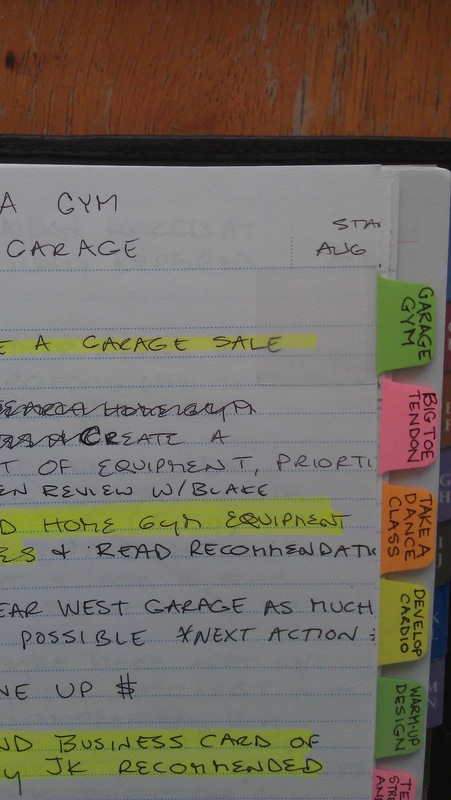 I loved the spacing of the lines (wide-ruled) and the fact that the pages were divided into four sections with differently colored lines and edging for for each section (red, blue, gray, green), but it was a pain to re-punch them. So, my A5 serves as a notebook for work. 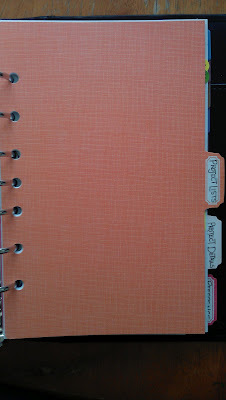 I won't be going back to the Filofax A5 as a planner/organizer, paper is too boring and thin. Too bad, because the Filofax binders KICK A$$. Sub tabs....brilliant! Very impressed with the dead lift video...way to go girl! I really love this post. So impressed by sub tabs trick. Thank you so much for sharing with us. Looking forward to read more posts from you. Have a very happy new year. dear smash your days thank you for your kind comments! You have actually inspired me to start blogging again but I have found that being inspired is quite different from doing so; only time will tell! Have a great 2015. Thank you so much sharing. This may sound weird but I wanted to know if it would OK to Pin one of your pictures to my Pinterest wall? I ask because I'm not sure if you are still blogging. Therefore, pinning a picture may drive a lot of traffic to your blog and bombard you with fifty million questions from the Pinterest world. I just want to be considerate. Aw, Tasha, considerate you are! Feel free to pin!